Wow, it has been a while. Roughly four years have gone by since the my last post. It might seem like a long time for some, but coming out of college and hitting the ground running as a full-time trader made it seem like the blink of an eye for me. That being said, I have recently come to miss it and have the intention to start blogging again albeit on an irregular schedule that will evolve based on my free time. Obviously since I have been trading full time my skill set has evolved so I can only imagine that the new perspective I hope to bring to the analysis contained moving forward will be more insightful. You will notice a few changes, the biggest one being that I no longer use R as my main language. I have all but fully moved my research stack to Python, so you can expect to see a lot more of it moving forward. As for the content, I think the focus will remain the same for the most part; algorithmic trading for the Equities markets. Finally I want to take the time to thank the readers that kept emailing and kept in touch during my absence from the blogosphere. I can only hope that the number of people that somehow find value in these short articles will grow over time and that I will meet other interesting people. You are after all the reason I write these notes. So a big Thank You to all of you. As we look to 2011 through the rear view mirror, I make a quick divergence from my recent lethargy to send my best wishes for 2012 to all readers. May 2012 be a trading year filled with opportunities you capitalize on. See you in the new year. In continuation with last post, I will be looking at building a robust ensemble for the S&P 500 ETF and mini-sized future. The goal here will be to set-up a nice framework that will be (hopefully) of good use for readers interested in combining systems in creating strategies. In order to make it more tangible, I want to create a simplified example that will be used as we move forward in development. I would encourage readers to actively comment and contribute to the whole process. Before we do anything, as with any project, I want to have an idea of the scope so I don’t get entangled in an infinite loop of development where I am never satisfied and continuously trying to replace indicator after indicator for a marginal increase in CAGR on the backtest. For this example, I want to use 4 indicators (two with a momentum flavour and two with a mean-reversion flavour), a volatility filter and an environmental filter. The strategy will also have an adaptive layer to it. Now that the foundation idea has been laid, let’s examine the mechanics at a high level, keep in mind that this is only one way you could about it. Basically I will be evaluating each strategy individually, looking at performance under different volatility environment and also with the global environment filter. Based on historical performance and current environment, exposure will be determined. This series will have R code for the backtest (still debating using quanstrat/blotter) and the simple example will be available for download. My point is to provide reader a way to replicate results and extend the framework significantly. More to follow! In our eternal search for the trading Holy Grail it is often tempting to try and find the “ultimate” signal (indicator) and apply it to as many instruments we can. This single solution approach for the most part fails miserably, think of a carpenter with only a hammer in his (or her; QF is an advocate for equal opportunity) toolbox. While making signals adaptive is definitely an improvement however, I think we sometimes miss the point. Instead of harassing and optimizing a signal ad absurdum to improve the backtest, one would be better served by looking at the big picture. One signal in itself only contains so much information. While there are a lot of good indicators that perform very well by themselves available (the blogosphere is a really rich ecosystem in that regard); their power is only magnified when combined with other signals containing different information. The secret is in the signal aggregation. In other words, in how we form and use an ensemble of signals isolating different pieces of information to build a profitable strategy (note the use of the word strategy as opposed to system, careful wordsmithing aside, the difference is paramount). This is a topic I have been taking a close look at recently and I think the blogosphere is a perfect tribune to share some of my findings. As a starter, here are some points I will be touching on in the upcoming series of post. 1. What are the basic intuitions behind ensembles and why can they help in building trading strategies? 2. How do we isolate and quantify specific pieces of information and then observe their effect on the instruments we trade. 3. How to we evaluate current pertinence of the signals. 4. Finally, how do we aggregate all the useful information and build a strategy from the ground up. The mechanics are going to be explained using a simplified example for readers to follow along but the intuition will be the same that the one behind the first QF strategy to be tracked real-time on the blog. I still don’t have a fancy name for it but it’ll get one for its official launch. First of all let me apologize for being off the grid for so long and not providing you with any of my geek prose recently. My final university semester classes are coming to an end today and I will resume regular posting after finals. However rest assured that my absence of the blogosphere has not caused quant power atrophy, it was merely a by-product of how busy I was with school and interviewing. Thank you all for sticking up with me during this dry spell. I recently obtained 50,000 views, while not an incredibly big number compared to the blogosphere’s behemoths (see blogroll), I personally am really happy. I never really thought that this blog would take these proportions and it keeps surprising me by bringing opportunities I never thought would be possible, and for that I must thank you. I know some of you were eagerly waiting for the TAA system post I kept saying would be coming soon; I am sorry to tell you that it will not. My services were hired by a private firm and the intellectual property developed is protected by a non-disclosure agreement. I might however discuss the intuition at a high level if the interest is still present. Finally some of you might have noticed the new “QF Strategies” tab up top. For now it shines by its emptiness but it will not for much longer. I will be tracking strategies there soon, bear with me. Now most of you probably wonder why I would overlook such a crucial aspect of model building. The reason is very simple; I never had to. Most of the models I design are for my personal trading and since I don’t have millions of dollar in capital to trade (yet! ), the scalability requirements are very insignificant. Most of my trading is on the mini futures and I only trade a few contracts per symbol. Keeping this in mind, I don’t have to worry too much about slippage when I place my orders since the effect of the order book are negligible. However, chances are I am not going to design models solely for my personal trading during my career. The scalability requirement for a hedge fund for example is however, very different. Imagine trading a high-turnover strategy on a single symbol, for the sake of example, consider a RSI2 strategy. It is a very short term strategy that has a relatively high turnover for an end-of-day strategy. Now trading this strategy with 50k is feasible (not optimal but not too bad), now think about trading the RSI2 signal on a single symbol with 100mm; very impractical. Think how much slippage would affect the strategy. At time of writing, the SPY opened at 133.02, trading 100mm would end up being about 751,654 shares at open quote. Admittedly, I don’t have the exact number, but I doubt that the order book opened almost a million deep at the ask and therefore we would expect some slippage effect. Presumably, it would be quite significant and would significantly change our expectation of return for our RSI2 strategy. Now I know that few hedge funds would trade a RSI2 on the SPY alone, it is only a conceptual example to support understanding, and I want to point out that I am not saying that RSI2 is non-scalable (nor that it isn’t). To evaluate scalability, we need robust backtesting clearly estimating the impact of the order book, latency (if intraday), and other relevant factors on the returns. Another angle to consider is scalability across assets, following our RSI2 example, if we allocate 50% to both the SPY and the QQQQ, in theory we reduce the weighted impact of slippage and other transaction costs on a given symbol (ie. the marginal transaction cost per symbol is decreasing when we diversify across assets). However, that effect is not necessary a linear one as nicely explained by Joshua in the comment section below. Other avenues to consider in scalability are left to the interested reader who can always contact me via email if they desire since I have recently paid closer attention to the issue myself. Furthermore, for readers with similar career desires to mine, remember that models scalability is directly related to employability! To follow up with last post, and also nicely tying into Engineering Returns’ recent sector rotational system I will show a factor decomposition of the S&P 500 from different sectors. In essence, you can think of it as a multifactor analysis where I try to determine what sectors are relevant for a given period in predicting the S&P 500. This kind of analysis is important since a lot of the point and click trading in proprietary firms is done based of price action and correlation across markets. It is the later part I address today. What we see from the table is that the consumer discretionary, financials, materials and technology sectors have statistically significant. Additionally, the financials and technology sectors seem to be precursors of reversals as indicated by their negative coefficients. The opposite holds true with the consumer discretionary and materials sector who seem to not be so contrarian. This simple analysis seems to indicate that these four sectors are the best candidates to consider when looking into cross markets relationships. Meric et al. (2006) say it best: “The sectors with high factor loadings in the same principal component move closely together making them poor candidates for diversification benefits. 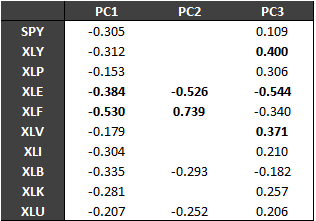 The higher the factor loading of a sector in a principal component, the higher its correlation is with the other sectors with high factor loadings in the same principal component. The sector indexes with high factor loadings in different principal components do not move closely together and they can provide greater diversification benefit. Some sector indexes may have high factor loadings in more than one principal component. It indicates that the movements of these sectors have some similarity to the movements of sectors with high factor loadings in more than one principal component. These sectors are not good prospects for successful sector portfolio diversification.” In depth interpretation of the table is left to the curious reader. In conclusion, factor decomposition/analysis can be very useful for traders to get a feel of their traded instrument of predilection. Be it for establishing significant lead/lag relationship or diversification caveats, both least squares and PCA can be valuable tools. Interested readers can also look at Granger causality for similar avenues. Enter your email address to subscribe to Quantum Financier and receive notifications of new posts by email. 60% of the time, it works every time. The content of this blog is provided for informational purposes only. Nothing herein should ever be considered investment advice or recommendation to buy, sell or hold any securities. Simulated past performance of a trading strategies does not necessarily accurately represents future performance. All information herein is not guaranteed to be error free. All trading decisions you make should be your own based on your own analysis and you should accept full responsibility for the profits/losses incurred during actual trading. Quantum Financier Powered by WordPress.com.